Joyce Myretta Layton Carlson, Born 7 May 1928 passed peacefully Sunday, 9 February 2014 with her four children, Trish Calhoon, Deb Hocking, George Dodge, and Brian Dodge nearby. We have been remembering her with love, humor, and much gratitude. Mom, though gone from this Earthly life, is not gone from our hearts and memories. The grandchildren and great-grandchildren will miss their loving and humorous interactions with her. Mom has always been a strong, independent, caring person who was more comfortable serving others than being served. These attributes helped her to be an outstanding cashier for many years. She must have been outstanding because that is how she met her husband, Robert Carlson, who preceded her in death. 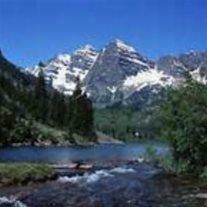 And her love of the mountains led to them spending as much time as possible each summer at Big Lake and Alpine. Mom enjoyed sports in her younger years, and played volleyball, basketball, bowling, and tennis. When the participation years passed, the spectator in her kicked in, and she could be quite vocal in her opinions on games, especially football. So, when visiting in recent years, we were fairly certain that if the TV was on, then surely a sport’s program was on or soon would be. Her last outing was enjoying the super bowl with family. Mom instilled in us a sense of independence, caring, gratitude, and humor. Her love of the mountains and travel lives on in us. So, we express our gratitude for her and the love she freely gave us. And to all who loved her, and cared for her throughout the years, we express our sincere appreciation. Arrangements by Bunker’s Garden Chapel.